So, how did your favourite song do on Saturday night? 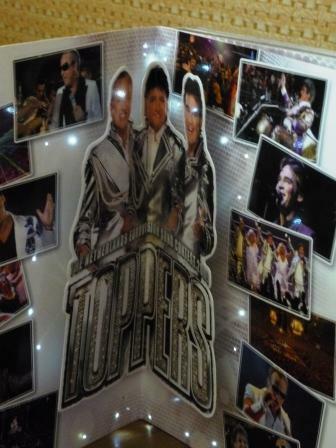 I thought that it was a really entertaining evening, from the opening act of Cirque du Soleil, through all the songs to the stunning interval act. I hear favourable things about how Graham Norton handled proceedings, which is good as it must have been a daunting prospect to replace Terry Wogan. Row 5 seats were awesome – although it was irritating to be sitting with people who seemed obsessed with getting on the television! 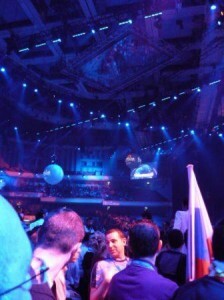 Funny also that there was a guy who was obviously the ‘flag police’ for the front section of the stage. Each time that anyone lifted a flag too high during a performance, or attempted to stand to take a photo – he pounced, and would shine a torch in the face of the offender. It seemed to work! As the floor manager says to the audience before the start of the broadcast, a lot of effort goes into perfecting the camera angles, vision mixing etc. – so to have the flag of Turkey blocking the shots (the main offender in our area) is disrespectful to all the efforts of the camera crew and the producers, but also to the artists. France did well to finish in the top 10. 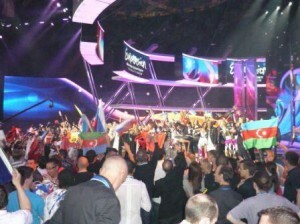 Azerbaijan snagged a well deserved third place. Sakis faded really, but still a top 10 finish isn’t bad in such a competitive field. And poor Chiara – way off the pace in 21st place. Perhaps it just shows that third time isn’t exactly a charm. 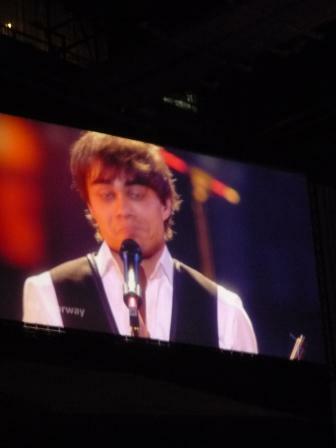 And as for Alexander Rybak – the hot, hot, hot fave from Norway, it was a stunning victory by a huge margin. Let’s face it – this song was always going to win, and it did so with great style. I’m very pleased that we’re heading to Oslo next year for Norway’s third victory (following 1985 and 1995). I’d better get saving once again, as a pint will set you back seven quid, apparently! 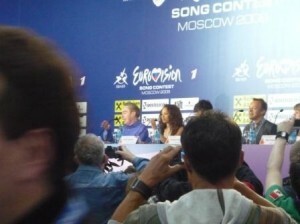 Must just say that at the press conference after his victory Alexander was charming and seem quite rightly chuffed with himself – any why not, he’s just won the Eurovision Song Contest. No pretentious affectation for this young man. I eventually got to bed at 5.15am, and had kinda forgotten that citytalk.fm were interviewing me at 10.50am! I was dead to the world when they called – just as well that I heard the telephone. We had a 15 minute interview and so that’s me up and about for the day. As we’re not travelling back until tomorrow afternoon I think the plan is to do brunch, then have a mooch, get some fresh air, and take it easy – we whooped and clapped out little hearts out last night… and I enjoyed every minute of it from start to finish. 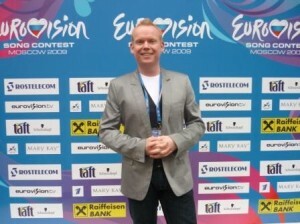 Apparently there were sightings of me again in the audience – I hope that Armani waistcoat was worth the money. And for long-time readers of this blog you will notice that the winning singer was wearing a waistcoat – so they are obviously back, back, back! So I’m going to sign-off now. Thanks for once again for following my movements – and I really hope that I’ve added a little something extra to your Eurovision experience this year. I hope to see you in Oslo next year?! Since I first wrote this post (on Sunday) I travelled back to Heathrow yesterday evening (Monday), and I’ll be driving back to Merseyside today. I had an interesting phone interview with BBC radio Lancashire before catching my flight – seems that the Contest has gone down well and there is national pride surrounding ‘our Jade’ – thank goodness for that. I wonder who will represent us next year? Far too early to be thinking about that! Can you believe that we were having a mooch around Moscow when we spooted the bus of the Greek delegation outside a hotel. Quite excited by the prospect of seeing Sakis we hung around in the lobby, but after a few mins we thought he wasn’t around. In the meantime we found a shop selling Russian dolls (thank goodness for that!). On our way back we once again passed the hotel where members of the Greek delegation were boarding the bus. 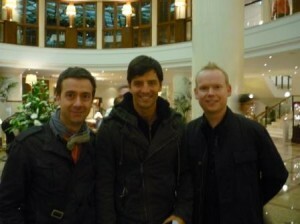 It was too much of a opportunity to miss, so we went back in the hotel – and within a minute there was the man himself! 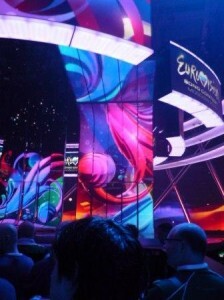 It’s a crazy old place in Eurovision World! Well, friends – it’s time for us to turn our attention to who might just win this thing! I’ve been here for just under one week, and have shared a wonderful experience with some good friends and colleagues. Karen, Brian, Toni and Apostolos have offered laughter and friendship as we have navigated our way through what is, in all honesty, a balmy week. 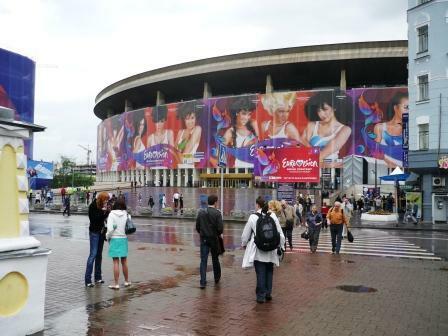 Trust me – you wouldn’t miss it for the world if you were in my shoes right now – how many people can say that they are at the heart of the biggest media event and song festival in Europe. 17 Germany “Miss Kiss Kiss Bang” performed by Alex Swings Oscar Sings! I promise I will try to avoid any more references to anyone’s time after this – as references to our song title are getting increasingly irritating – and that was just in the UK press conference this afternoon! 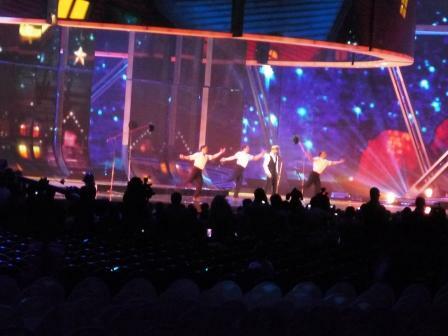 So, that’s given you a clue as to where I was following the first rehearsal of the final earlier today. 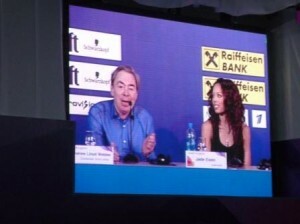 Some good questions were put to the panel – although to be fair most interest was all things to do with… ‘the Lord’. He was asked why he was here – and he said that he had nothing to lose as the UK couldn’t do any worse than they did last year, finishing in last place. Good answer Andrew! Jade was also asked if she was a little jaded (see what I did there) about not getting as much exposure as the Lord… she suggested that she was here to sing and that all the talking could be done by everyone else! Nice one, Jade! I asked the final question of the press conference – quizzing the BBC delegation as to why they are suddenly making an effort that everyone – including Vladimir Putin – is noticing. They suggested that they had always taken it seriously – well, really? Not so sure many of us would agree with that. 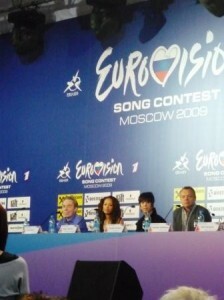 What we can agree on is that this delegation are all behind Jade and the song. As are we… and my mum and dad! Thursday evening and a packed Olympic Arena here in Moscow. I had mixed feelings about this group of songs – but many of them came through rather dodgy rehearsals with some good performances. Some failed to impress and were sent home. As for the ‘Napkin of Death’ I did OK – getting 8/10. That means I got 16/2o in total. As Ruxandra has comented in disbelief, I’m normally much worse at this prediction lark! Gotta get me some white pants! And spare a thought for poor Ireland. 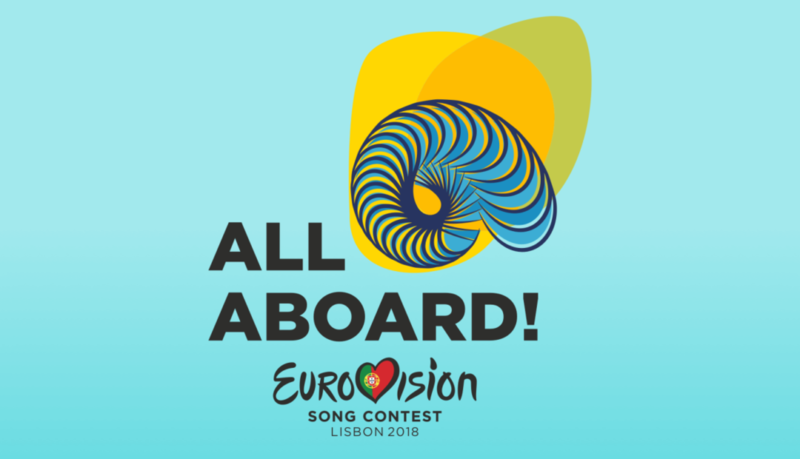 I thought that they did a great job, and I was sure it would go through – but with three countries left to reveal it was clear that is was out of the running – with the hot faves still to come. 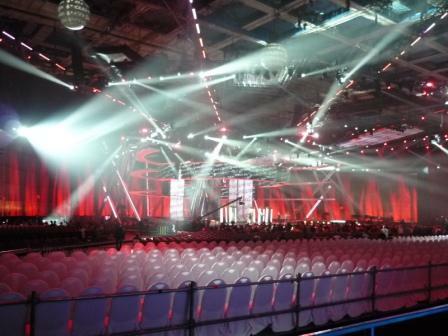 Here’s my last view of the arena last night – stunning lights or what. Irish flags weren’t exactly waving, and Irish eyes certainly weren’t smiling. It’s 19:00hrs local time on Thursday evening – and I’ve had an awesome day – I met Chiara, the Maltese singer, at the recording of a TV special that will be broadcast on Maltese TV tomorrow night. It was fun and also a little surreal. She was lovely – but more about that on the Boom Bang A Blog in the morning. We’re off for dinner now, and then off to the second-semi final. Remember, I’m on row five! Apologies to the local radio producers trying to track me down – I will return all calls/e-mails after the semi-final tonight! It’s time for the Moscow BBAB jury to once again implement the napkin of death…. Moo, ha, ha, haaaaaaaaaaaaaaaaa! Brian and Phil: YES! Karen and Toni: NO! Karen and Toni: YES! Phil and Brian: NO! Phil: YES! Karen, Toni and Brian: NO! Brian and Toni: YES! Karen and Phil: NO! Phil, Karen and Toni: YES! Brian: NO! Brian and Karen: YES! Phil and Toni: NO! Some good songs in the second semi are actually undermined by somewhat dull staging – I’m thinking Estonia in particular. And as I feared in the rehearsal stage (see earlier entry), poor Poland was * terrible* – she started in the wrong key and couldn’t recover. Sakis Rouvas (above) did not disappoint from a performance point of view – although the vocals were not at full strength… and why should they be – it’s the bloomin’ dress rehearsal. The frenzy is building, let me tell you. I’ve championed it from the start, and I’m not going to stop now – but Bosnia and Iceland will run it close. 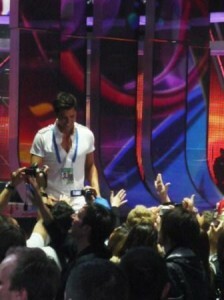 We might also underestimate what a star Sakis is in Greece. My flatmate this week, Apostolos, went back for second helpings at the second rehearsal on Wednesday – as they’re all so behind the song now. Don’t miss it – you promise?! Ireland: a good effort that I would like to see qualify. Serbia: This is the one to refresh the drinks and pass round the nibbles! It’s like listening to a couple having an argument! Azerbaijan: despite my grumbes about the mix of the song, this is sailing through, and could well be top 5 at the end of the contest. Albania: now this is a song that I quite lke, but today the dancing jelly baby/morph mutant left me fearing the worst… it could well cost it votes, like the stilts did for Bulgaria in the first semi-final. Ukraine: for those of you who might have given your children too many sweets, and then lived to regret it – then this is what your Eurovision entry would look like if you gave it too many sweets. 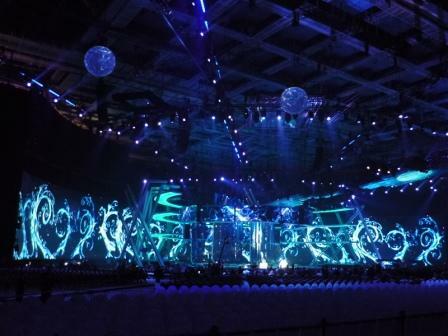 The song is good, but the circus is in town when it comes to the staging. Having said that (here comes the media lecturer in me! ), look out for the stunning camera run that goes from the back of the auditorium and then switches to steady cam around the perfomer in one seamless move – it’s fab! Shot of the contest. Taxi for Jackson the geek, anyone? 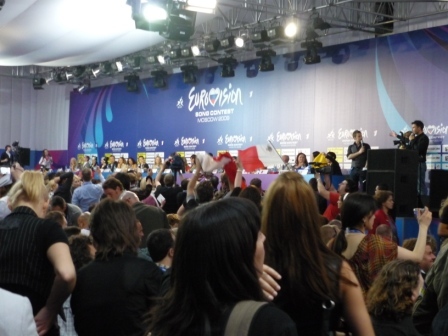 Hope you enjoyed the first semi-final last night – and thanks for those of you texting and generally getting excited about the fact that, a) Eurovision 2009 was finally underway, and b) that I was there! Please don’t forget that we are 3 hours ahead, so it was 2300hrs local time – and after 0100hrs local time when it finished (I am trying to stay on UK time so that the late nights don’t destroy me!). 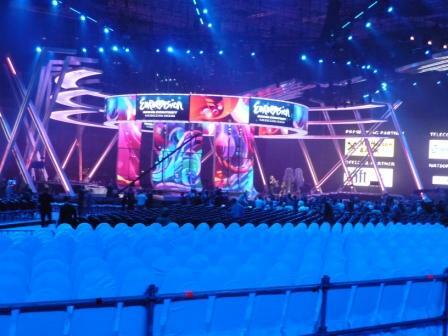 When you are watching on Thurs/Sat if you look at the floating polo (as I refer to it) above the stage, we are sitting slightly to the left of the middle piece with the logo on it – you can see my view of it above. That’ll give you a rough idea of where I am. I was sitting in row eight, amongst the cheering fans. 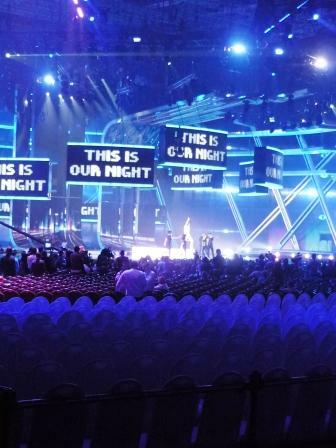 On Thursday and Saturday Brian and I are in row five! 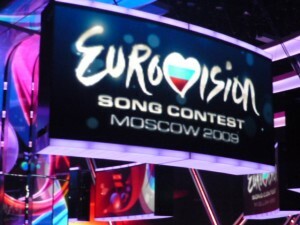 It was an enjoyable night – and the best songs (in the main) got through to the final – although I do feel slightly disappointed for Andorra. 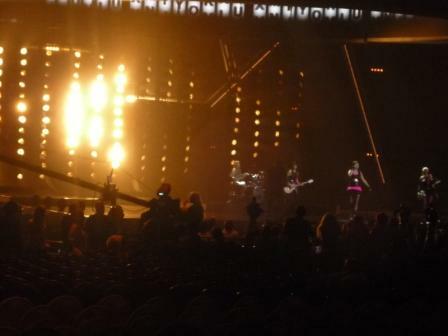 The highlight of the night was the performance from Iceland – truly the most professional job, as well as a great song and great vibe. I’d be chuffed if it won this thing! 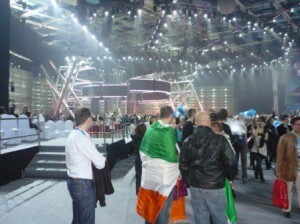 Did you see how the TV producers kept us hanging on until the final country to confirm that Iceland made it! Phew! 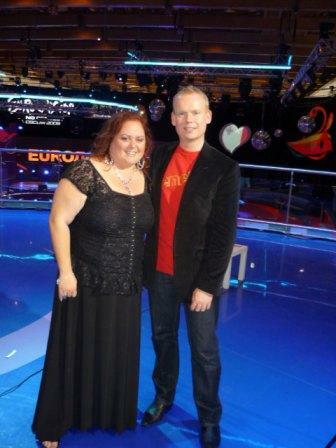 Here is Johanna moments after the show ended. Who says there’s no such thing as a free dinner? Who tells you that you can’t get something for nothing? Well, here at the press centre you can! We get given loads of freebies – and as I said last year, this is to coerce good copy from us journo types, reporters, bloggers, liggers and people fiddling with hair straigheners and hairspray. 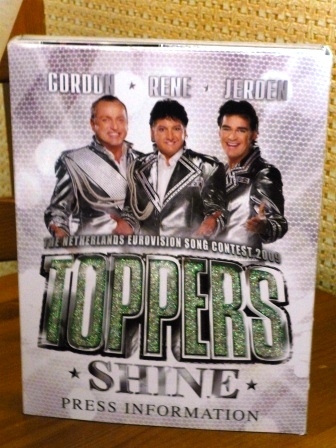 I was more than a little chuffed with my Sakis Rouvas freebie – a goodie bag that contains a promo CD and a scarf that cleverly says “this is our night” on it. Clever – do you see what he did there? 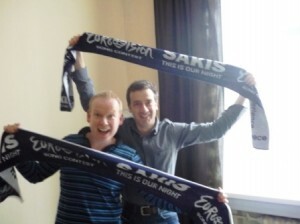 I’ll be flying the flag for Sakis on Thursday, and I’ll now do it with my scarf! Cool. 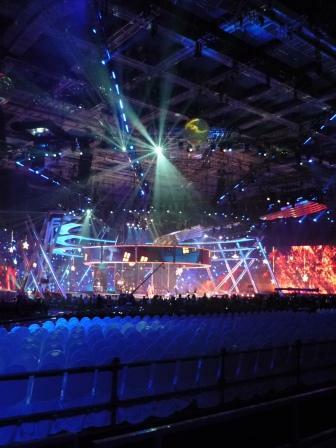 After a rather ropey schlager-not-so-tastic rehearsal today I’m not convinced that such novelties will ensure The Netherlands a safe passage to the final?